The deadline for little funny is on the 20th… so you have less than a week to get yours in. Which is probably not a big deal, as it will probably only take you one evening of fun to get an issue together. 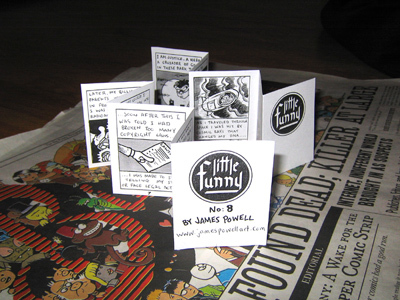 little funny, again, is a series of micro-comic booklets authored by anyone who wants to do one that will be sold out of a vending machine at the BIG FUNNY opening. It is easy, fun and inexpensive to participate… and all entries will be accepted. You can read all of the details about the project here. All participants in little funny will be listed on the BIG FUNNY website, and we’ll eventually have scans of all the covers posted there as well. Some people have been confused by the instructions… I tried to clarify them some more in the text. Additionally, here is a photo of two copies of little funny #8 by James Powell (the front of one and the back of the other). I swear you’re going to drive me nuts with the little photos here and the little photos there of the actual friggin’ Big Funny newspaper! Huzzah! I stuck 30 copies of my Little Funny in the mail yesterday! Can’t wait for the show.